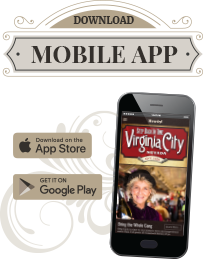 For the most immersive experience, download our Virginia City, Nevada mobile app and listen to the stories that are carved in history. 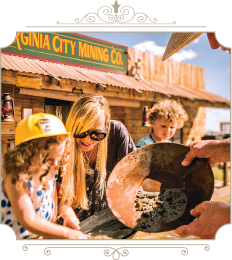 A narrated journey of Virginia City it guides you on a journey through the streets once literally paved in silver ore.
A walking or driving tour of Virginia City highlights our rich Comstock mining history and lets you step back for a moment of time. 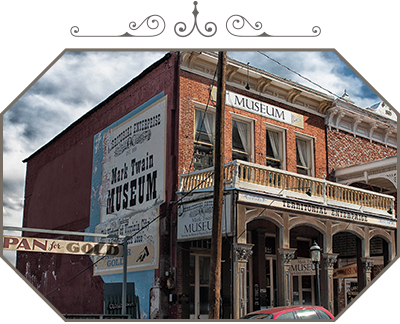 See and learn about some of our most noteworthy sights and structures and hear brief histories designed to give you a sense of what it was like to live in Virginia City during its heyday. 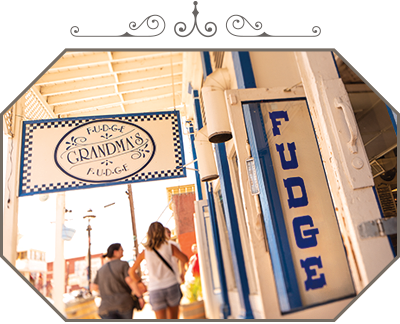 The following tour recommended order that takes you from the Visitors Center to the rich heritage that is Gold Hill, located approximately one mile south of town. A narrative version of this is on the mobile app. 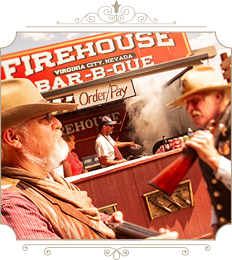 Welcome to Virginia City, home of the Comstock Lode, the 19th-century mining center bonanza that turned Virginia City into the most important industrial city between Denver and San Francisco in the late 1800s. 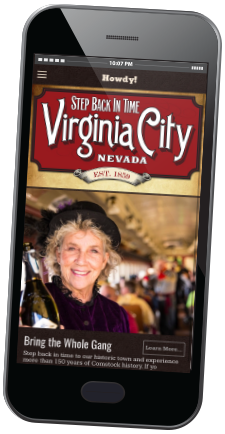 We believe that you must see Virginia City to understand it. 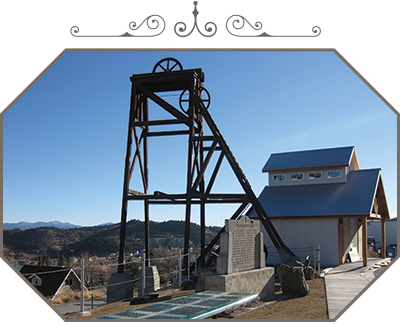 Here you can view mining artifacts and learn a bit more about our history. Newly opened in 2012, the Visitors Center was awarded the “Statewide Excellence in Grants” award. In 1869, the last rail of the Virginia and Truckee (V&T) Railroad was laid to connect Virginia City with Carson City. The freights shed operated until 1938 after which time it was used as a stable, lumber yard and storage house. The route remains largely unaltered today following the extensive renovation efforts of the incredible stewards who had the vision to rebuild and reopen the train and railway. 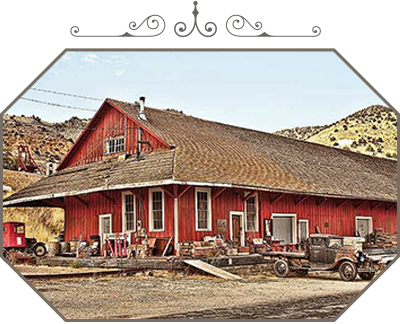 Today, visitors experience the journey of our miners by traveling the rails from May to October annually with scheduled departures on the shortline from Virginia City to Gold Hill and on the longline from East Gate Station in Carson City to Virginia City. Learn more about the V&T Railway longline here. Rising out of Six Mile Canyon is Sugarloaf Mountain. In 1901, the Butters cyanide sugarloaf mountain mill operated at its foothills. Dotting the landscape are mine waste rock dumps and tailing piles of some of the earlier underground mines and mills that surrounded the town. 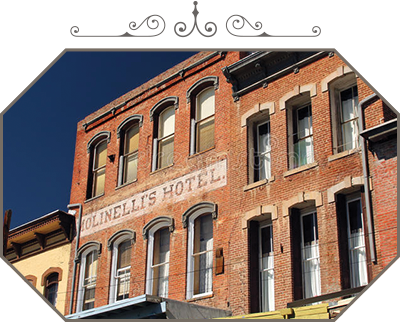 Now part of the Silver Queen, Molinelli’s Hotel was established in 1879 and remained in this building for many decades. In the 1880s it shared the ground floor with a retail liquor store and a popular restaurant called the Capital Rotisserie and Saloon. This building was shared by a number of business establishments during the 19th century including William Spencer’s Retail Liquors, Pearson and McCourt Wine, Liquor and Cigars and the Palace Restaurant. This building was built as a saloon in 1876. 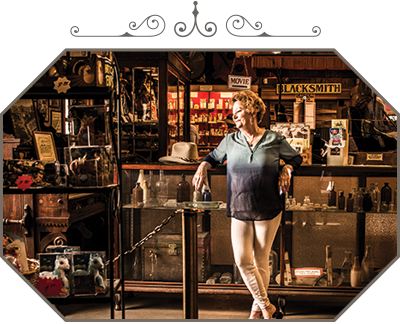 In 1878, the first floor was shared by a saloon and a cigar and tobacco shop. Five buildings south on C Street is the former Roos Brothers Clothing Store, identifiable by the traces of the sign that remain from when the entire width of the building under the cornice was painted. 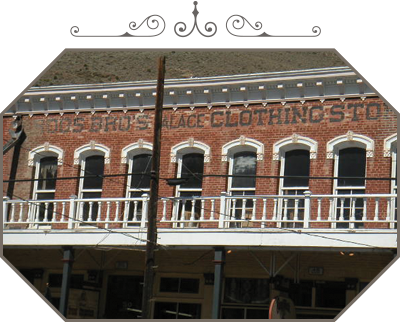 The Roos Brothers established an important clothing business at 20-22 C Street in 1876. 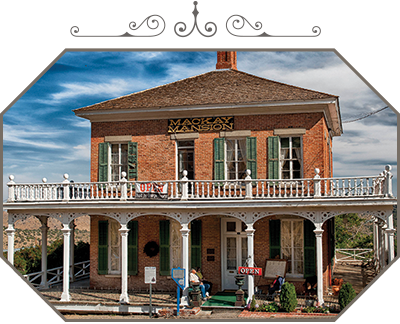 This structure was built in the 1870s to house the first territorial enterprise in the Nevada Territory. The Territorial Enterprise was known for the flamboyant style of journalism developed in its earlier years by such writers as Mark Twain, Alf Doten and Dan De Quille. 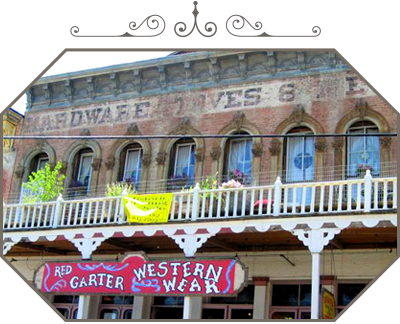 In 1876 this building housed the hardware plumbing supply enterprise of John Gillig, a prominent businessman in Virginia City. This building originally housed a dry goods and clothing store on the ground floor and an insurance concern on the second floor. The bar itself, which was originally established in 1867 in the Old Washoe Club, moved to this building in the 1930s. 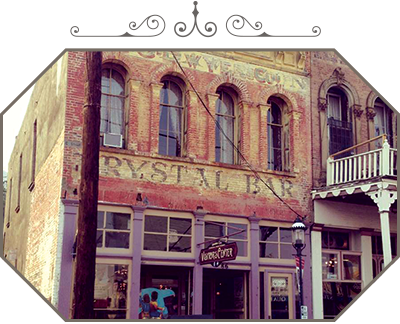 The Crystal Bar now serves as the welcome counter for the numerous visitors that visit the town annually. Here you can take a rest, ask questions, purchase attraction tickets and even grab a free bag of popcorn. 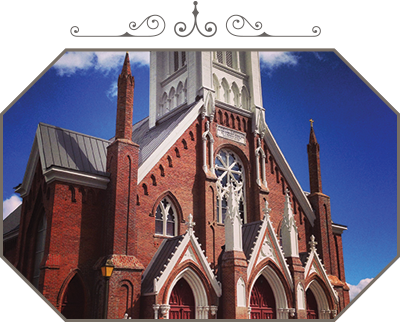 The present St. Mary’s Church is the fourth structure erected in the city by the Catholic congregation. The former churches were all destroyed. The large brick structure you see was rebuilt and dedicated in August 1877. The original structure that housed St. Paul’s Episcopal Church was built in 1862 and was destroyed in the fire of 1875. The church was rebuilt the next year on the site where it stands today. Looking towards the Mackay Mansion, you’ll see a greenish stone and brick foundation that mark the remains of the hoist house of the Gould and Curry Mining Company. The hoist house was built over the Bonner Shaft which was sunk in 1864. By 1873, the mine had reached the 1,800-foot level with a total production of $15,525,110, in 1800s dollars. 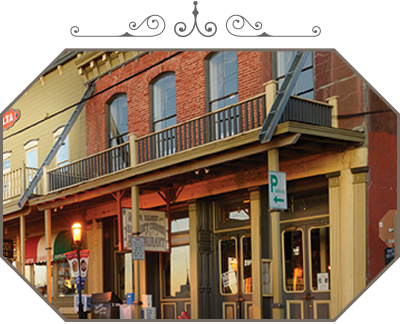 Over time, this well-kept brick structure has housed many diverse establishments including a broker’s business, a meat market, a saloon and a brewery. 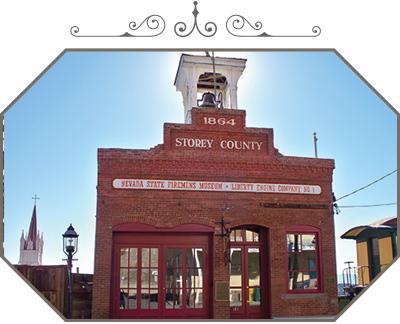 The building dates from 1876 and was rebuilt after the fire of 1875 destroyed the original structure. 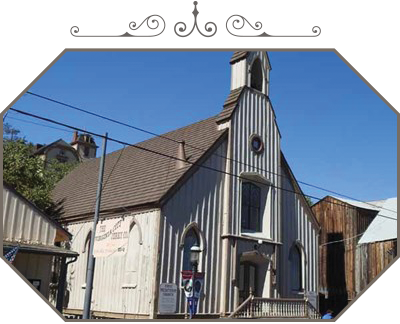 The Presbyterian Church was the only original church structure in Virginia City to escape the great fire of October 1875. 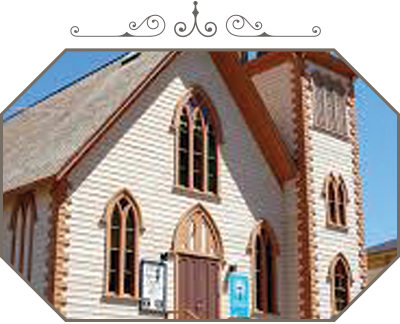 It was built in 1867 with funds raised by its congregation from mining stocks and was maintained with income from two stores built at the same time on either side of the church. 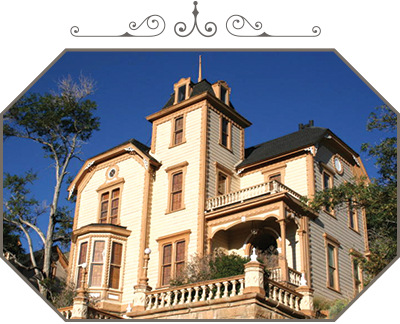 In 1863 Robert Greaves, the superintendent of the Empire Mine, imported the castle workman and furnishings from around the Cape Horn to fashion this European castle-style residence. The house boasts a three-story tower with a breathtaking view of the surrounding area. 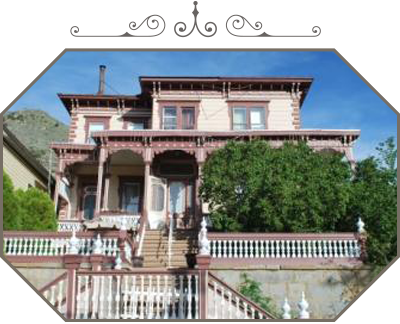 This two-story Victorian mansion was built in 1887 by A.M. Cole, a prominent Virginia City pharmacist. 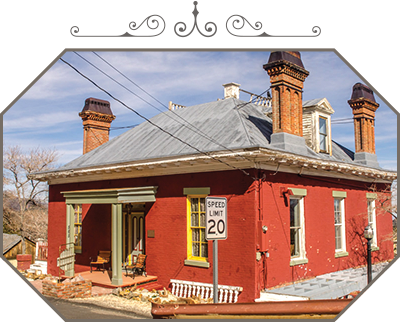 Known as the old Water Company Building, this structure was built in 1875 to house the Virginia City and Gold Hill Water Company. 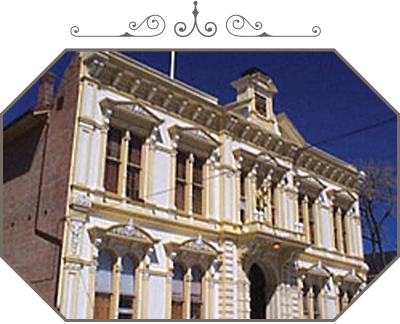 The ornate High Victorian Italianate building, built from 1876 to 1877, the courthouse embodies 19th-century ideals of law and order. Construction began in 1876 after the previous building was destroyed in the fire of 1875. It served as a courthouse, county offices and the jail. It is adorned by an un-blindfolded Lady Justice to show that justice is not blind and is just one of a few in the country. 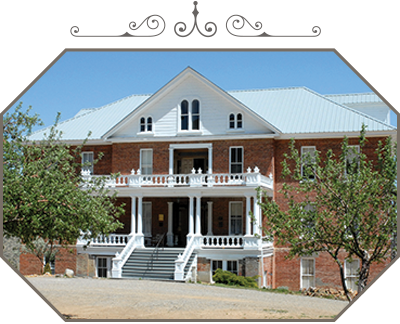 Today, the Courthouse houses the Courthouse Slammer and County Museum providing an overview of Virginia City’s and the county’s role in its history. 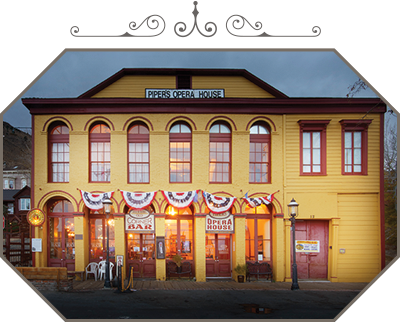 During the last 20 years of the 19th century, Piper’s Opera House served as one of the centers of cultural activity on the Comstock and in the West. 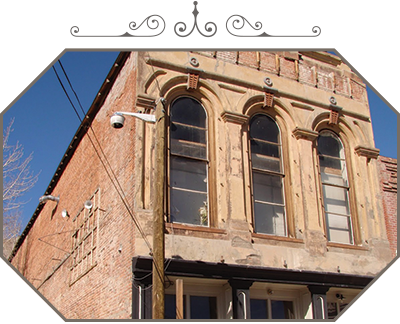 The Knights of Pythias building was erected in 1876 as a lodge for the group, a mutual aid and protection society started in Virginia City in 1873. The Fourth Ward School is the last one of its kind still standing in the United States. The 1876 Second Empire, four-storied state-of-the-art wooden school preserves the real story of life in a booming Old West mining town. The Chollar mansion was built between 1861 and 1863 as the head office of the Chollar Mine and the residence of the mine superintendent. 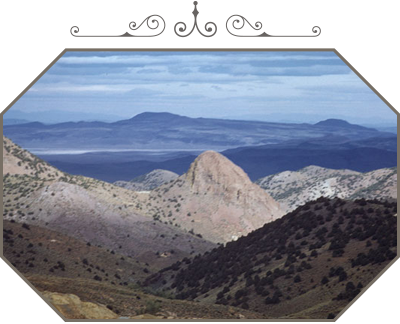 The mansion was originally commissioned by Billy Chollar, the discoverer of the Chollar Silver Lode in 1861. Built in 1876, the St. Mary’s Art Center was originally established as the St. Mary Louise Hospital by the Sisters of Charity and Bishop Patrick Manogue. The 36-room hospital included five wards and 12 private rooms that could accommodate more than 70 patients. The mill is located on F Street near the old amphitheater, where the V&T Railroad and gold mill tracks cross the street. 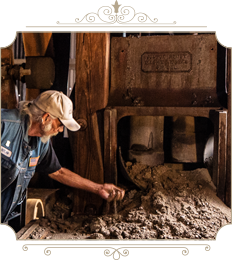 The Comstock Gold Mill is reconstructed in a building attached to the Arizona-Comstock Mill. 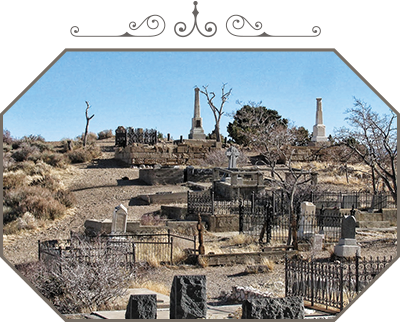 Beginning in the 1860s, a wide variety of fraternal, civic and religious groups established burial yards on the hillside. Nearly every plot is fenced or bordered, a typical practice of the Victorian period. 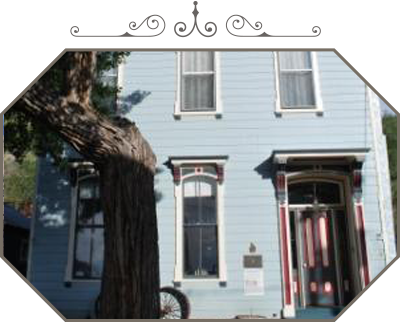 If you want to know what it was really like living on the Comstock and step back in time, visit the Way it Was Museum. 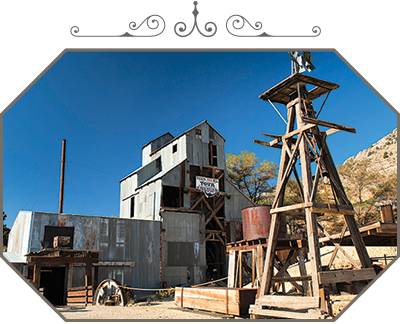 This museum displays the most complete collection of Comstock mining artifacts in the world as well as rare photos, lithographs and maps of the “Bonanza” period. 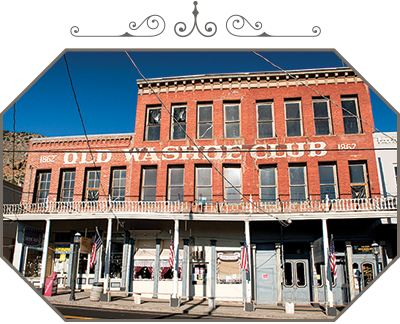 The Washoe Club is a three-story brick structure located on C Street and has been named as one of the most haunted locations in the west. Watch for orbs! 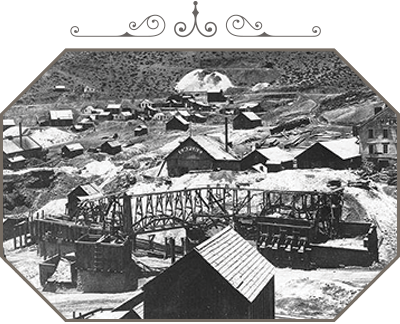 The Virginia & Truckee Railroad (V&T) was built under the direction of William Sharon, manager of the Bank of California, owner of many mines and most of the mills on the Comstock. 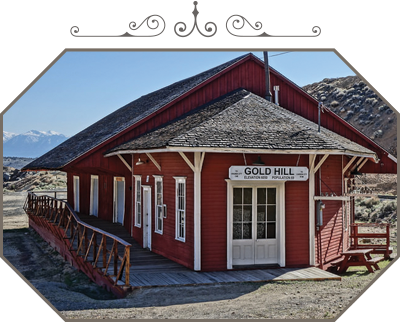 The Gold Hill Station on the V&T was completed in September 1869, and the first locomotive passed through American Flat Tunnel on November 3 of that year. 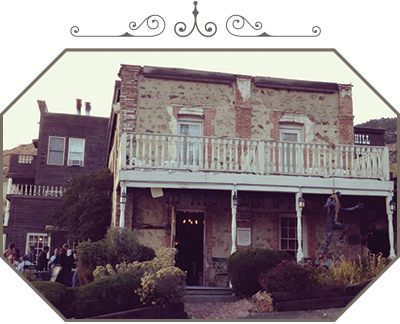 H. M. Vesey acquired the hotel early in the 1860’s and added the wooden structure to the Gold Hill Hotel’s original stone building. 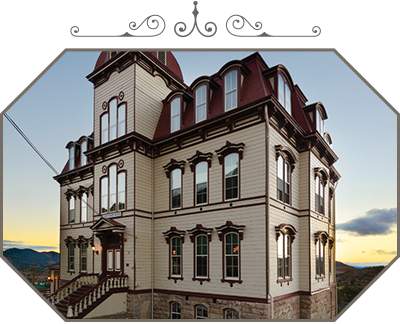 The hotel became an important part of the now thriving metropolis of Gold Hill which was adjacent to the even larger industrial and business center known as Virginia City.